Everyone knows a full size vehicle will run fine in the city or on the highway, but stopping is another matter. Classic Industries® offers a solution to this age old problem. The conversion set includes the components to convert your full size mo del's standard "weak" drum front brakes to a well stopping disc brake setup. Important: Photo for illustration purposes only, conversion set contents may vary. Additional part s may be needed for installation. Application Notes: This set is designed for use with original stock drum brake spindles. 14" x7 " minimum wheelsize. Not for use with aftermarket 2" drop spindles. Important: Brake conversion kit will fit most 14" x 7" wheels. 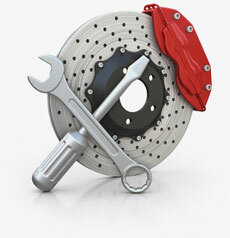 In cases where calipers touch wheel, a wheel spacer or modifications may be required.